1. P3X63Ag8.653 murine myeloma (or another fusion partner of choice) should be thawed in advance and propagated in flasks or roller bottles for at least 2 wk at <106/mL in DMEM with HT, 8-azaguanine and 10-20% FBS preselected for superior growth in preliminary experiments and other supplements, as described in the previous sections. 2. 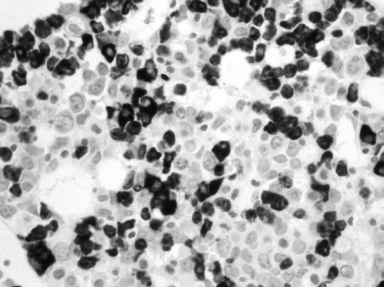 Grow myeloma cells in the presence of both selection drugs, cryopreserve every 10-14 d, and use these cells (kept in 8-azaguanine-free and HT-free medium for 7 d) for the fusion procedure.